ST. PETERSBURG, Fla. -- Minor League Baseball today named Reading Fightin Phils right fielder Dylan Cozens winner of the 2016 Joe Bauman Award, presented by Musco Sports Lighting. Cozens will be honored as Minor League Baseball's home run king at the Baseball Winter Meetings in December with a trophy and a check for $8,000 representing $200 for each home run he hit. The award, first presented in 2002, is named for Joe Bauman, who set a then-professional record with 72 home runs in 1954 while playing for the Roswell Rockets of the Class-C Longhorn League. 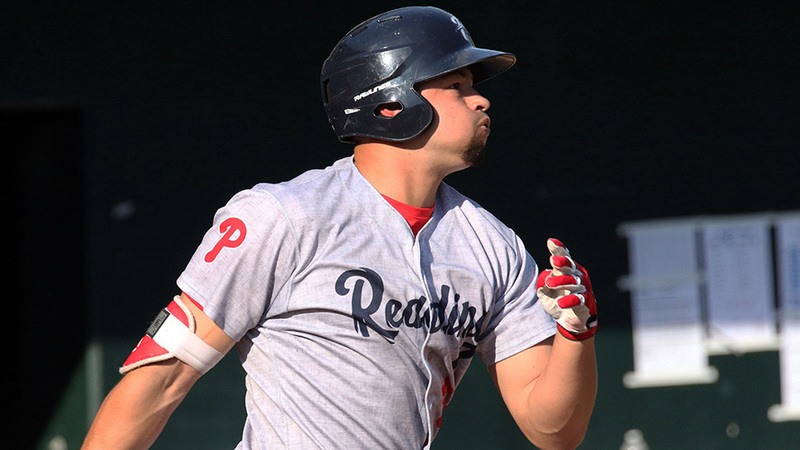 "I want to thank my teammates and coaches in Reading and the entire Phillies organization for a tremendous season," said Cozens, who helped lead the Fightin Phils to the Eastern League playoffs. "The fans in Reading were amazing all year and it made for a very memorable season. I can't thank Musco Sports Lighting enough for their generous support of Minor League Baseball and the Bauman Award." Cozens, 22, was selected by the Phillies in the second round of the 2012 First-Year Player Draft (77th overall) from Chaparral High School in Scottsdale, Arizona. In his first full season with Reading, Cozens hit more home runs (40) than he did during his first four seasons combined (38). He is the fourth consecutive player under the age of 23 to win the award, following A.J. Reed (22) in 2015, Kris Bryant (22) in 2014 and Joey Gallo (19) in 2013. Cozens was remarkably consistent throughout the year, hitting five home runs in April, nine in May, eight in June, seven in July, nine in August and two in the first week of September. He was named Eastern League Player of the Month in May, was the Eastern League Player of the Week twice and was named to both the Mid-Season and Post-Season Eastern League All-Star teams. Cozens' toughest competition came from teammate Rhys Hoskins, who hit 13 home runs in June to tie Cozens for the MiLB home run lead at the end of the month (22). Hoskins ended his 2016 season with 38 home runs, the second-most in Minor League Baseball. In addition to the Joe Bauman Award, Musco Sports Lighting also presents the leader of each classification level with a check for $500. There was a three-way tie for the 2016 Triple-A home run crown. Jesus Aguilar (Columbus, Indians), Hunter Renfroe (El Paso, Padres) and Kyle Jensen (Reno, Diamondbacks) each homered 30 times. Jensen will receive the $500 award as he led the trio with 120 RBI. Jensen, 28, was originally drafted by the Miami Marlins in the 12th round of the 2009 First-Year Player Draft out of Saint Mary's University. Lynchburg Hillcats (Indians) first baseman Bobby Bradley led the Single-A level with 29 home runs in the Carolina League. He hit 10 of his 30 home runs during the month of August. Bradley, 20, was selected by the Indians in the third round of the 2014 Draft out of Harrison Central High School in Gulfport, Mississippi. Ogden Raptors (Dodgers) left-handed hitting center fielder Cody Thomas led the Short Season-A and Rookie-level leagues with 19 homers as he hit three with the Arizona League Dodgers and 16 with the Raptors. All of his home runs came against right-handed pitching. Thomas, 21, was selected by the Dodgers in the 13th round of the 2016 Draft out of the University of Oklahoma.